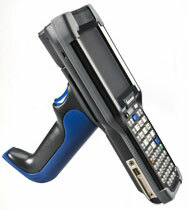 Intermec CK3R - USB interface, Wi-Fi (802.11b/g/n), 2D Imager, Windows Embedded 6.5, 256MB RAM/512 ROM, Numeric Keypad, Bluetooth. Includes battery. Interface cables and charging cradle sold separately. Spare Battery (Part# 318-033-021). Quad charging dock (Part# 871-230-101). Requires Power Supply (Part# 851-810-002) and AC power cord (Part# 1-974028-025). Optimize your operations into an efficient, automated, and high-performing work environment with the Intermec CK3R, the mobile computer you can count on to keep your workers running productively at full speed to deliver enhanced workflow performance. Protection Boot Kit, Compatible with CK3R. The Intermec CK3RAB4S000W4100 is also known as Intermec Technologies	INT-CK3RAB4S000W4100	.